Maybe you think the dog park manual is a little out of your reach right now, price-wise (even though it costs just 1/6 of of a day's consulting time of any dog park development expert)? 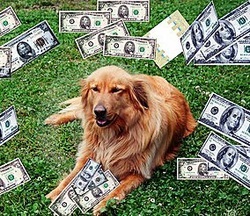 Maybe your dog owner's group needs to start raising some cash for your own dog park? Maybe you just want some easy money in your pocket for yourself? Then the Affiliate Program is for you! The affiliate program through Commission Junction will pay you up to 20% commission on the sale of every dog park manual (or anything else in the DogParksUSA(TM) online store) and 30 return days for all of your website visitors (this means you or your group get almost $18 for every dog park manual sold through your affiliate link -- sell just 6 dog park manuals through your site and you will have earned the money to buy your own dog park manual free and clear including the shipping!). You are free to display other dog-related product ads that match and enhance your website's content, if you wish -- not just those of DogParksUSA(TM) -- and make money off of those products, too! You get higher commissions than pay-per-click ads. You can set it up to receive monthly checks from your affiliate sales; they even now pay electronically via PayPal. After you sign up, you will get an affiliate or program ID number (a PID number). To get credit for any sales from your site, you will replace the "PID" in the link below with your PID; then just add that link to your website and drive traffic to it. There is no expiration; this is revenue that can be ongoing as long as you position the link so visitors to your site can find it and be driven to it, or tweet about it, place it on your facebook page, email other dog owners groups about it. The possibilities to earn revenue are endless! Ready to join? Click here! (this link is not a DogParksUSA(TM) link and clicking on it will bring you to the CafePress affiliate program site in a new window; Commission Junction and CafePress run the program and DogParksUSA(TM) has no authority to handle any payment issues with that program. That being said, DogParksUSA(TM) has been with CafePress since 1999 and has never had any payment issues, so you likely won't either. ).